With respect to references to the role of county government in my feature article, “90 Proof: Liquor Licensing in Wisconsin,” in the May 2009 Wisconsin Lawyer, I should have more correctly stated that the license-application process may take place with the county clerk where municipal authority has been delegated to the county. Article IV, sections 22 and 23 of the Wisconsin Constitution and Wis. Stat. section 59.03(2) permit a county to take over the powers and duties of a municipality. The licensing process in any municipality that has delegated such authority to the county board would go through the county clerk. Endnote 4 should have been supplemented with citation to this constitutional and statutory authority. My apologies for any confusion this may have caused. And my sincere apology to Ms. Debra Brehmer for misspelling her name at endnotes 8 and 11. I am licensed to practice in both Texas and Wisconsin. 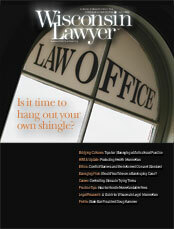 This article confirmed and offered insight as to how the legal field is changing. In the Houston metropolitan area there are more than 20,000 lawyers, and everyone here seems to be competing on price (a sign of commoditization, as the article described), which has driven a lot of lawyers out of practice or forced them to find legal employment elsewhere. Since last April, I have been trying to differentiate my services without using price. I had to dust off my MBA textbooks and read up on SWOT analysis and creating a competitive advantage. A year later I am coming closer to realizing my goal of finding my niche and bypassing commoditization. In the legal field, there are not enough resources written about marketing. I have found the most informative advice from books targeted at accountants and consultants. Thanks for the wonderful article. I will definitely be purchasing the author’s book. As a member of the State Bar of Wisconsin since 1990, I have long appreciated Wisconsin Lawyer’s purpose of providing attorneys with news and practice aids that directly improve the delivery of legal services to clients. And as its readers know, the magazine generally fulfills that function exceedingly well. But unfortunately, the editorial board went far off course when it recently chose to let the magazine be used to propagandize the euthanasia/assisted-suicide crusade (see the April 2009 article “William Colby on Society’s Challenge: Finding a Better Way to Die”). Mr. Colby’s obvious personal views and objectives are set forth under a guise of “let’s talk.” And just what is he telling us in his lengthy article? Certainly not much in terms of legal news or practice aids. While he manages at one point to make a vague reference to a “one-page power of attorney for health care,” for the most part he offers what in essence amounts only to this false proposition: Because assisted suicide is sometimes effectuated by certain admittedly ugly means (in particular, involving the use of a secret room and then the placing of a plastic bag over the head of the person who is to die), therefore other (unidentified, but ostensibly “better”) means of assisted suicide should be regarded as morally and legally acceptable. Of course, Mr. Colby is entitled to his illogic. And even a Kansan who’s not a Wisconsin attorney – and who apparently holds to a bizarre belief that one’s loss of the ability to speak is equivalent to death itself – is free to suggest that the people of the state should change their mainstream homicide laws to suit his desires. But why should he be given the singular platform of Wisconsin Lawyer’s cover story from which to advocate his position – and without there being even a counterpoint article to engage the debate? Running Mr. Colby’s article in this way undercut the value of a magazine that should be dedicated to serving the profession – not to advancing such political/social agendas regarding moral issues.